After being forced to either stay on legacy firmware and enjoy the liberties jailbreaking provides, or upgrade to iOS 7 and have to live with a stock installation, users now have the power placed firmly back in their hands. The recent release of the latest Evasi0n jailbreak means that we will start to see plenty of new tweaks being uploaded to the default Cydia repositories, with HiddenSettings7 being one of the latest offerings to land in the jailbroken app store. We aren’t offering any festive prized for those that can make an educated guess and predict what the HiddenSettings7 package offers in terms of functionality. It was more than six months ago when an investigative developer in the iOS community discovered that Apple had bundled a number of settings into iOS 7 that were hidden away from end-users. It was only a matter of time until we welcomed a new jailbreak into our lives that would pave the way for aforementioned settings to be uncovered through the installation of a tweak. HiddenSettings7 is that tweak. 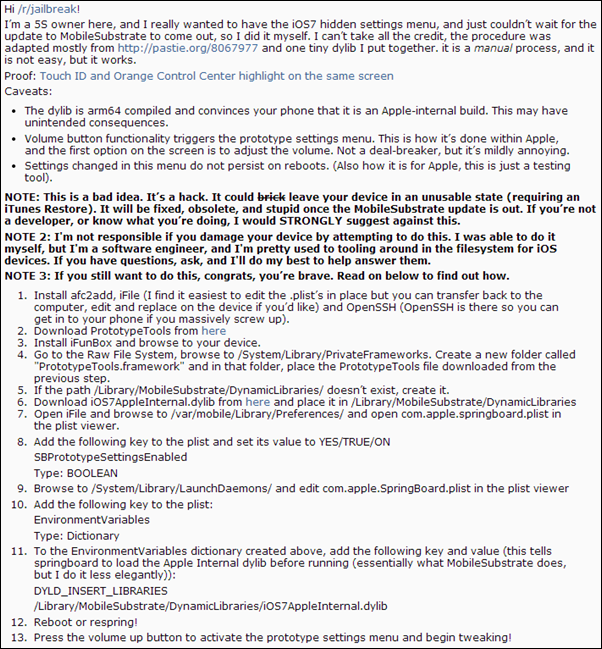 The developer in question, known as deVbug, has obviously decided that the settings offer enough functionality to warrant exposing them to all jailbroken users. Installation of the package is extremely simple and pain-free. Interacting with the package is just as simple, with the tweak manifesting itself as an additional button within the new iOS 7 based Control Center. 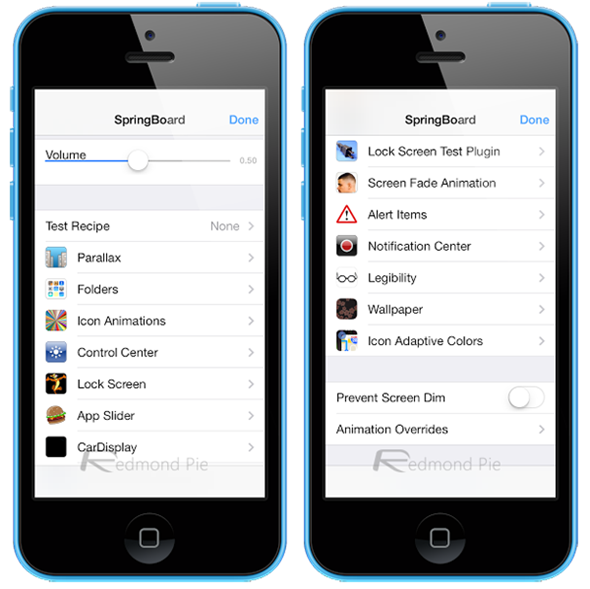 Tapping that new ‘SpringBoard Settings’ button immediately dismisses the overlaid Control Center and presents the user with a new tabled list of settings which Apple had intended to remain hidden. Exposing these settings allows owners of jailbroken devices to dramatically customize interactions and the way that certain aspects of the iOS device works. Options to alter the behavior of icon animations, folders, parallax scrolling, screen fade animation and text legibility are all present. Researching and amending different settings can result in a dramatic overhaul of how an iOS 7 powered device works. 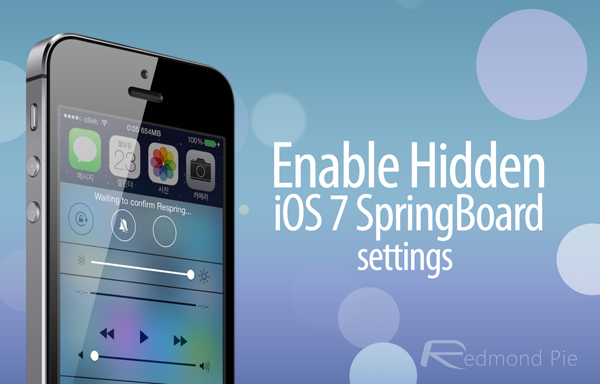 HiddenSettings7 is available as a free-of-charge download from the BigBoss repository and requires a jailbroken iPhone or iPad running iOS 7.0 or above. Since the MobileSubstrate package isn’t compatible on 64-bit devices yet, DO NOT install it on an iPhone 5s or iPad Air yet. A user named michaelrcarroll on Reddit has posted an alternate method to enable access to hidden settings menu on A7-based devices like the iPhone 5s. While the method is long and a bit complex. it may well be worth trying.